Some kind folks in Big Bend recommended this park and I’m so glad they did. It is technically in Mesa, AZ, but is so close to the east side of Phoenix, that you may as well call it Phoenix. Anyway, I’ve been here since Monday and have been enjoying the warm weather and sunny skies. Average daily temps have been in the mid to upper 70’s with lots of sun and the nighttime temps have been in the mid 40’s to low 50’s. Perfect! This is such a popular park I couldn’t get in when I arrived so got a number and proceeded to the Overflow lot where I spent the day and night. Fortunately I was number 3 on the list, so I was able to get a spot the next day. Today, I noticed the overflow for the overflow lot is full up, so some folks may be waiting a week or more to get in. My, my, my, I’m not sure it’s all that, but whatever. I’ve had fun hiking, geocaching, and mountain biking the trails. My second bike ride afforded me not one, but two flat tires, so I had to walk and push the 2-3 miles ACROSS THE DESERT back to the campground. Ha! I was suffering in silence only because there was no one around to complain to. I took my bike to a local bike shop yesterday to get it fixed up and interestingly learned that desert riding requires seriously substantial tubes due to the “serious thornage”. The tubes I got are not only much thicker than the ones I had, but are also filled with slime, a self patching substance that is supposed to fill thorn holes on the go. I rode today for about an hour an a half and did not get a flat, so that’s good. 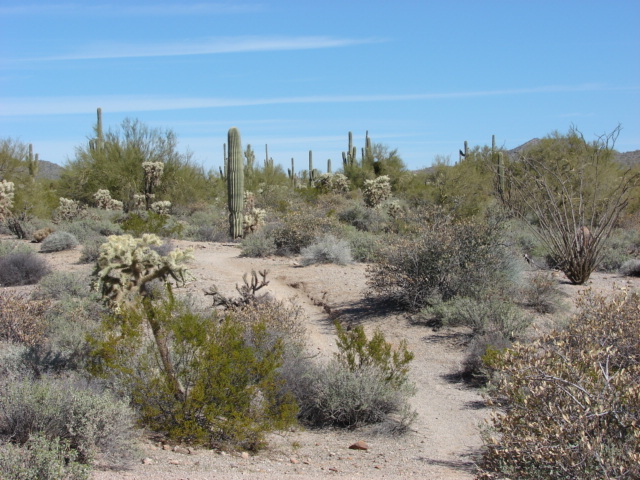 The trails are indeed prickly affairs since there is cactus everywhere. 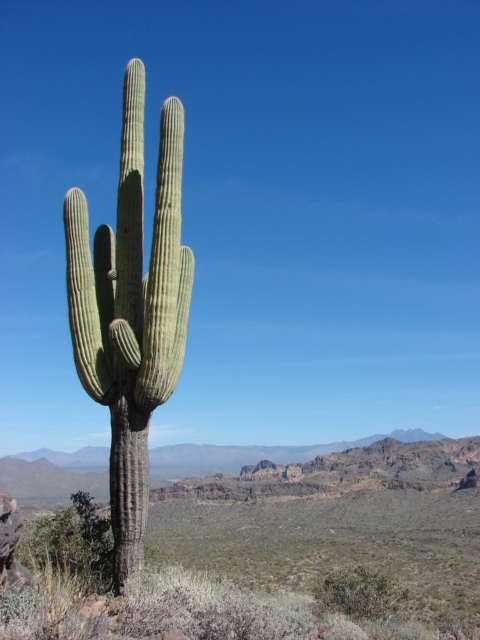 In fact, you don’t catch a turn just right, you may wind up impaled on a cactus 9 times bigger than you. No foolin’ take a look! 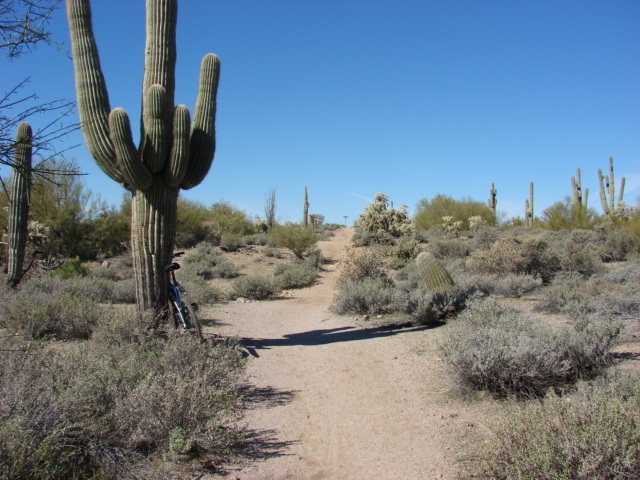 Did you notice my bike leaning against the cactus? Here’s another shot of the bike/hiking/horse trails. The day before yesterday I went on a 7 mile hike around a mountain and up over a pass to the other side. Great hike! 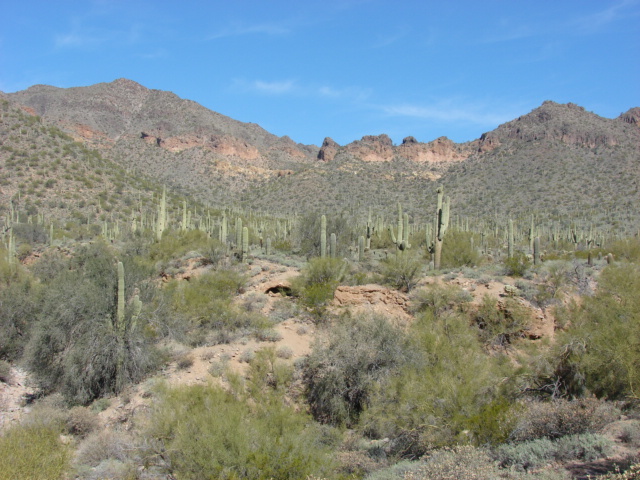 It took me over into the Tonto National Forest which is pictured below. And here is a shot I took up near the Pass. I’m at the laundromat doing load upon load of laundry at the moment trying to get some housekeeping taken care of before hitting the road. I’ve got an appointment early tomorrow morning to have the oil changed in Dora and in her generator along with a few miscellaneous repairs and then its off north to my new home. Home for the next 6 months or so anyway. While Clarkdale is only about 145 miles north of here, the climate is quite different since it’s “over the rim”. I don’t yet know what “over the rim” means, but I do know that the rim is what creates such different climates in the same general area. As far as I can gather so far, Clarkdale runs anywhere from 20-30 degrees cooler than Phoenix. It’s still in the teens and twenties up there at night. Brrrrr. I’ll have to get out my flannel sheets til Spring hits in those parts. That’s it for now. Stay tuned for news from Clarkdale. We spent a week in Mesa a couple of years ago. On one day trip we went out through Apache Junction through the Superstition Mountains to Tequila Flatts. Your pictures look exactly like some I took there. It is rugged country but beautiful. I appreciate the tip about the bike tires. I wouldn;t have thought the trails were that hard on tires but the thorns explain it. We plan to go through that area this fall in our RV if gas doesn’t go too high (haven’t figured out how much is too high yet). I am enjoying following your travels. It may answer some of your questions about The Rim. My daughter lives in PHX, the northern part. If you want her phone number I will get it for you. she is in advertisement, and a hiker. Neat, I remember the first time I was in PHX and headed to the Grand Canyon thinking cool we are so close and I about froze to death that night on the trip up there. That Rim got me good, I never knew any thing about it. when we lived in New Mexico we always went over to there but knew better to check the weather then. Loved the Montezuma Castle National Monument which I am sure you will get out to explore. Looking forward to your next update and wonderful pictures! Wow! This looks like a great place to ride and explore.